On June 26, Grace-Marie’s Kitchen Cooking School at Bristol Farms presented a cooking class and luncheon in collaboration with the Italian Trade Commission and Eos featuring wines, cheese and speck from Alto Adige, Italy. I had never tasted any of these marvelous products before, so it was a wonderful introduction to the area for me. Grace Marie provided some wonderful California- style recipes perfect for entertaining family and friends utilizing the following authentic alpine ingredients: Speck PGI, and the following cheeses: Alta Badia, Lagrein and Dolomiten Konig. The regional wine selection included Tiefenbrunner Pinot Grigio and Kurtatsch Cortaccia Lagrein. Alto Adige, Italy borders Austria and is very mountainous, covering a large part of the Dolomites and Southern Alps. Italian and German are both spoken, however German is the most common language. Potato Dumplings, known as Knodel in German and Canederli in Italian, made with speck and spinach, are much more prevalent in this area of Italy than spaghetti. 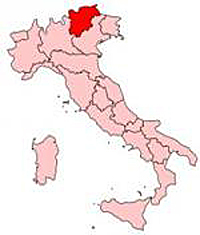 The Alto Adige area has been important since time immemorial due to the existence of the Brenner Pass through the Alps and so whoever controlled the region could control all trade flowing north and south from central Europe to Italy. It has been fought over for centuries and has many castles and forts perched upon mountain tops to guard the mountain valleys. One of the products I had for the first time was Speck Alto Adige PGI. 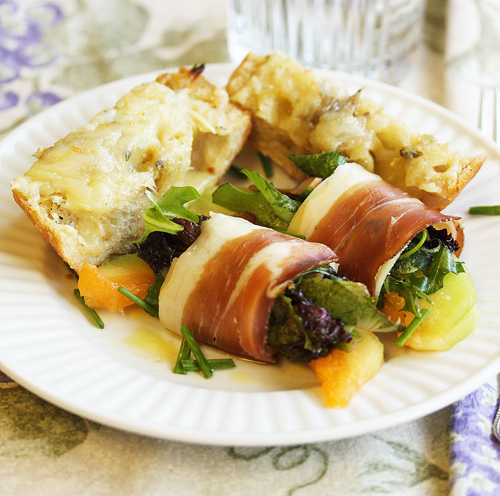 It is a flavorful cousin of bacon, prosciutto and pancetta. Speck is made from boned hog legs and seasoned with salt, pepper, laurel and juniper berries, then rested for a month. It is then cold-smoked at no more than 68F using flavorful low-resin beechwood, ash or juniper for 10 days. Then aged (air-cured) for 22 weeks producing a smoky, slightly spicy product with a distinct pink/red interior with a small amount of fat and a salt content less than 5%. 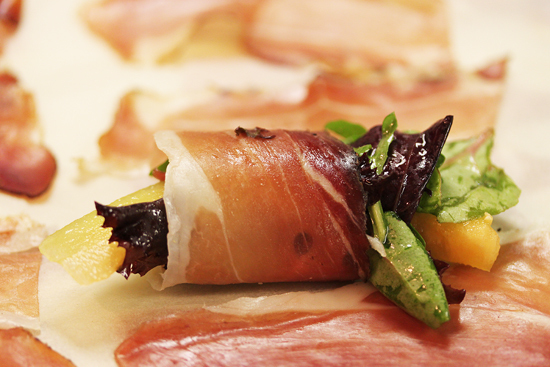 Grace-Marie chose to highlight speck and Dolomiten Konig in a wonderful appetizer, Speck and Dolomiten Konig wrapped Baby Greens and Summer Melon, accompanied by Alta Badia Savory Bread Toasts. I know how much you like photos of melted cheese, so here is a close-up. Next on the menu was a Quick Summer Pasta with Alto Adige Speck and Lagrein Cheese. 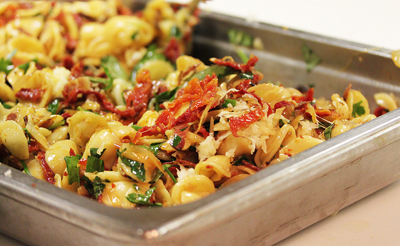 This was such a tasty pasta dish, which included one of my favorite ingredients, sun-dried tomatoes. It also used Lagrein cheese, which I fell in love with, that is cured with “Lagrein” wine and spices. 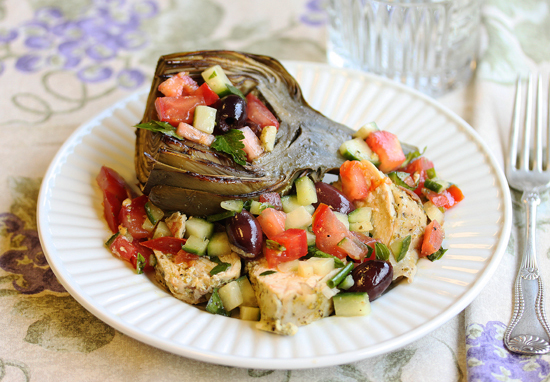 This recipe includes artichoke hearts; however, Grace-Marie’s artichokes had small hearts, so she left them whole and included them later in the chicken dish. The Herb Grilled Chicken with fresh Summer Garden Vegetables was just a spectacular and photogenic dish. The chicken was so tender and flavorful, and the vegetables were crisp and colorful. The addition of the whole artichoke just took it from great to magical. 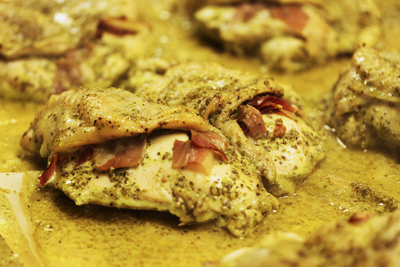 First the chicken was marinated in a white wine, olive oil and herb mixture. Some of the chicken was baked. Notice the speck under the skin. Grace-Marie sautéed two chicken breasts on the stove top to demonstrate that technique. 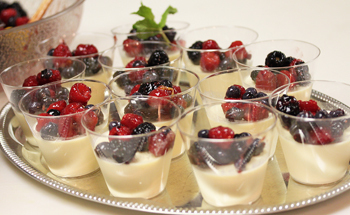 As you can imagine, we were all stuffed by this time, but the desert Grace-Marie prepared was a light White Chocolate Panna Cotta with Summer Berries. Guilt-free. The perfect finish. 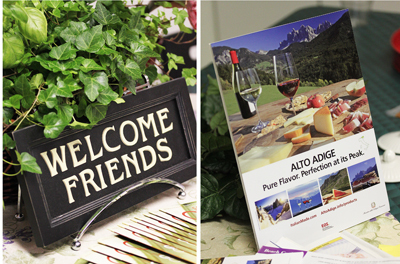 Special thanks to Vincenza Kelly of the Italian Trade Commission for visiting with us and discussing the wonderful wines and gourmet products of Alto Adige. I hope you come back soon, so Grace-Marie can create more fabulous dishes from Alto Adige, Italy! 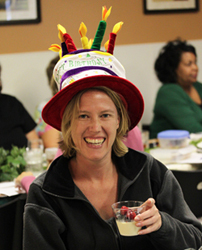 But then there was one more surprise – a birthday! With a birthday hat and a candle! 1. Combine vinaigrette ingredients in bottom of a salad bowl. Season with salt and pepper. 1. Place the Speck onto a work surface and top with the cheese. Put a small handful of greens onto one end of the Speck, top with slice of melon, then roll tightly, allowing some of the greens and melon to show through the ends. 2. Depending on the length of the Speck, before rolling, you may want to cut each piece in half crosswise and create a second roll. Arrange fold down onto a serving platter and drizzle with any remaining vinaigrette. Dolomitenkonig Cheese is a soft-textured cheese made in the Swiss style. It has a full flavor with just a dash of sweetness and a hint of walnut. Made exclusively using the high quality cows milk of the Pustria Valley, Dolomitenkonig closely follows an ancient local recipe which requires at least 60 days of aging. Its characteristic feature is its slight convex shape and unmistakable holey texture. 1. Place the chicken in a shallow casserole dish. Gently lift up the skin and lay the speck onto the chicken. Replace the skin over the Speck and chicken. 2. Blend the wine, oil, parsley, rosemary, garlic, salt and pepper in a food processor or blender. Pour over the chicken (top and bottom). Cover with plastic and rest at room temperature for 30 minutes or refrigerate up to 2 hours. Remove from refrigeration at least 30 minutes before cooking. 3. Prepare and warm an outdoor or stovetop grill to medium heat. 4. Arrange the chicken, skin side down, onto the grill and cook uncovered, until browned (5 minutes). Using a spatula, turn over and cook the second side in the same manner until the juices run clear (approximately 155F internal temperature). 5. Transfer to a cutting board, cover loosely with foil and wait 10 minutes before slicing. 1. In a large bowl, combine and toss the vegetable ingredients. Season with salt and pepper. Slice the chicken through the skin crosswise, layer onto a serving platter and arrange the vegetables over the top. 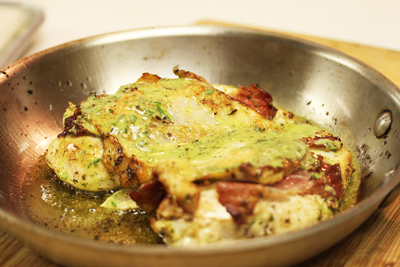 Oven method – roast the chicken, uncovered, in a casserole in a 400F oven. 1. Warm the oil and butter in a large skillet over medium heat. Add the Speck and shallots. Sauté, stirring, for a minute or so. 2. Stir in the artichokes and tomatoes. Continue to sauté and stir until warmed through. Remove the skillet form the heat, add the wine, them return to the heat. Cook until absorbed into the vegetables. Season lightly with salt and pepper. 1. Add the cooked pasta to the skillet with the sauce. Cook and stir until warmed through. Remove the skillet from the heat and stir in the cheese, basil and parsley. 1. Serve family-style, warm or room temperature, garnished with additional cheese and any leftover herbs. Weinkaese Lagrein Cheese – This wine flavored cheese, from Alto Adige, is produced with pure mountain milk from the high Venosta Valley. It is characterized by irregular cracks and by a pleasurable elastic, but compact consistency. It is cured with Alto Adige’s own “Lagrein” wine, resulting in a fine balance between the cheese, wine and spices which gives it an unmistakable aromatic and intense taste. This is a pure cow’s milk cheese aged between 2 – 3 months. 1. Warm the oil and butter in a large saucepan over low heat. Add the shallot and cook until just lightly golden (2 minutes). Turn off the heat and stir in the dried herbs, salt, pepper and red pepper flakes. 1. Preheat oven to 400F/ Line a baking sheet with parchment paper. 2. Arrange the bread, cut side up, onto the baking sheet. Generously spread the oil mixture over the cut portion of the bread. Scatter the cheese over the top. 3. 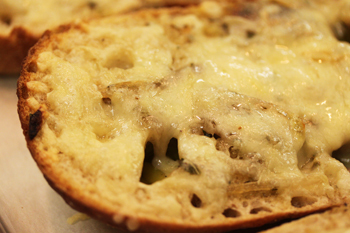 Bake until the bread is nicely toasted and the cheese begins to melt (15 minutes). Remove from the oven and cool slightly. Slice into 1-inch thick portions, transfer to a basket or serving platter. 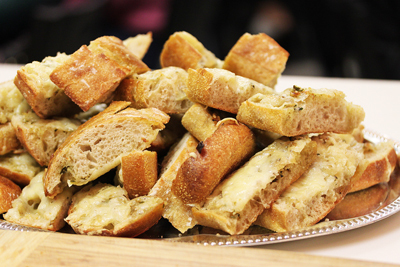 Serve warm or room temperature garnished with a sprinkle of chives. Alta Badia Cheese – this cheese has the mountain flavors of spice, fruit and earth without being either overpowering or too rustic. It takes its name from the beautiful Alta Badia valley in the heart of the Dolomite Mountains in Sudtirol/Alto Adige where Italy borders on Austria. It is made with fresh whole milk and is aged for 180 days. This cheese takes on the typical light brown rind and has a firm consistency. The paste is slightly straw-colored, very flavorful and aromatic. It is used frequently in local dishes as it melts well. When served as a table cheese, it pairs well with light, fresh, fruity reds. What a wonderful experience…I always love trying new cuisines and food products. After such a decadent and delicious meal, I imagine that the light berry dessert was just perfect. 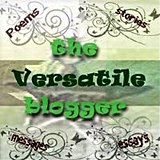 Thanks for sharing the recipes and the photographs from this event! God I would have killed to have a taste of some of this food. Especially that pasta…it had me salivating. What an awesome experience! Wow… all this food looks amazing. 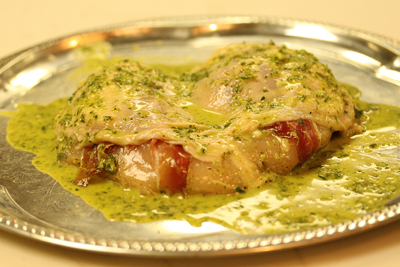 It is funny that speck is served in the exact same way as prociutto, even the chicken reminded me of Chicken Saltimbocca…. oh and the Panna Cotta… I think I am dreaming. Whenever we go to Europe I can’t get enough Speck. Love the stuff! This experience looks like you had a lot of fun. Stunning pictures! 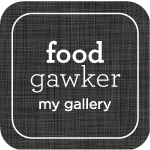 Such wonderful dishes and amazing photos…Great post! 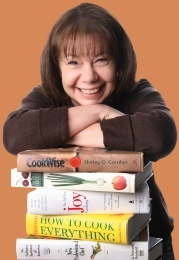 Sorry I missed Grace Marie’s June 26th cooking class which collaborated with the Italian Trade Commission. But your photos and description convinced me visit Bristol Farms tomorrow for the ingredients to make the Summer Pasta with Alto Adige Speck and Lagrein Cheese. I can’t wait to taste it!